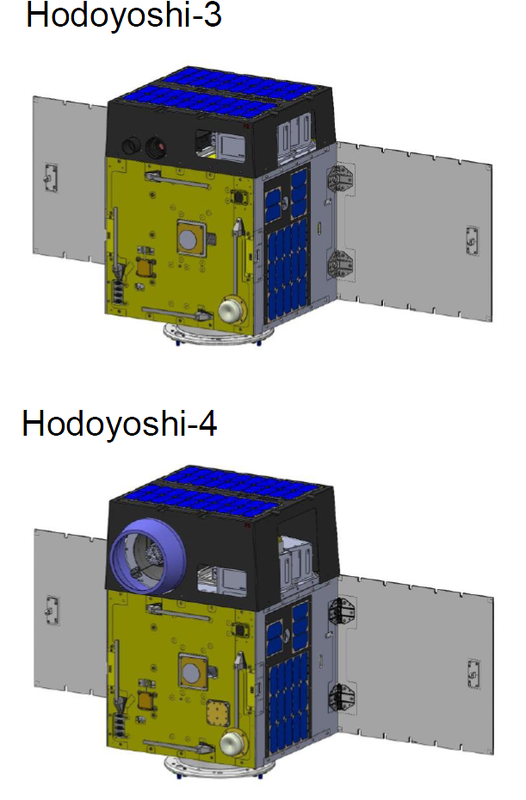 The Hodoyoshi 3 and 4 satellites are two Earth Observation satellites developed and operated by the University of Tokyo to demonstrate a series of satellite systems with particular focus on the optical imagers that are being tested on the spacecraft. Both satellites use a similar structure, but include different subsystems for technical demonstrations. Hodoyoshi 3 is 0.5 by 0.5 by 0.65 meters in dimensions weighing 60 Kilograms. The spacecraft is equipped with body mounted solar cells and two deployable solar panels to deliver a maximum power of 100 Watts that is distributed using a 28V and a 5V power bus. Power is stored in a 5.8Ah Li-Ion battery and the expected average power consumption of all satellite subsystems is 50 Watts. The satellite is three-axis stabilized using star trackers, an inertial measurement unit and a reaction wheel assembly to provide very accurate Earth pointing capabilities. Telemetry downlink and command uplink is accomplished via an S-Band system with an uplink rate of 4kbps and a downlink rate of 4 to 64kbps. Mission data is downlinked via an X-Band system achieving data rates of up to 10 Mbps. The Hodoyoshi-3 satellite is outfitted with a Hydrogen Peroxide propulsion system for orbital maneuvers and orbit maintenance. Hodoyoshi-3 is equipped with a Low-Resolution Camera that can achieve ground resolutions of 200 meters along a ground swath of 491.5 Kilometers and a medium resolution imager that can reach a ground resolution of 40 meters with a swath width of 82 Kilometers. The Hodoyoshi-4 satellite is 0.5 by 0.6 by 0.7 meters in size with a mass of 66 Kilograms. It also uses body-mounted solar panels and two deployable panels to generate 100 Watts of power. Satellite stabilization is also accomplished with star tracker data and reaction wheels. Communications are done in S-Band for TT&C like on Hodoyoshi-3, but the Hodoyoshi-4 satellite uses an improved X-Band system that will demonstrate data rates of up to 100Mbps. The Hodoyoshi 4 satellite is equipped with an Xenon-fueled ion-thruster for propulsion achieving thrust of 260 micronewtons and a specific impulse of 1170 seconds. The system weighs 6 Kilograms and measures 39 by 28 by 16 centimeters and includes a Xenon tank with a capacity of about one Kilogram. The propulsion system can deliver a total delta-v of 240 m/s requiring a peak power of 30 Watts. The Hodoyoshi-4 spacecraft is also demonstrating an Earth observation payload. This high-resolution optical imager uses a pushbroom sensor to acquire Earth imagery at a ground resolution of 5 meters. The system weighs 3.5 Kilograms and has an aperture diameter of 15 centimeters and a focal length of 10 centimeters. The imaging payload covers four spectral bands – Blue (450-520nm), Green (520-600nm), Red (630-690nm) and Near-Infrared (730-900nm). The observable ground swath is 30 Kilometers wide. Both Hodoyoshi satellites carry a secondary Store-and-Forward Payload for water level monitoring sensors deployed in many places around the globe. The store and forward payload operates at a UHF frequency of 400MHz and uses sampling frequencies of 10kHz or 40Hz. 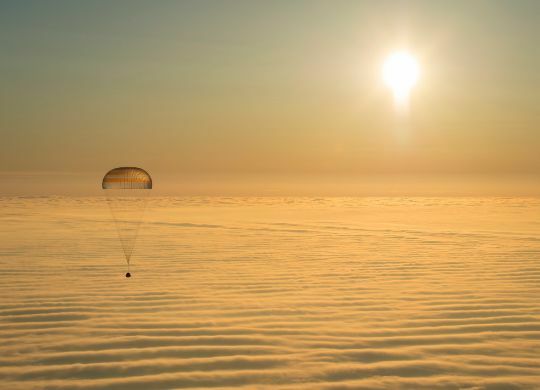 The payload has an onboard data storage capacity of up to 16Gbits to store data packets that are received in data transmissions of one second transferring 270bits and ten seconds transferring 2970bits of data. Using the two satellites, the monitoring sensors have passes every 11 to 13 hours, every 24 hours in the worst case. Data latency from the point of acquisition to downlink to a ground station is under six hours.